Somerset cidermaker Thatchers Cider has continued to deliver strong growth. For the seventh year running, the fourth generation cidermaker reports growth ahead of the cider market thanks to increased distribution and popularity of its premium Somerset ciders, including its flagship brand Thatchers Gold. 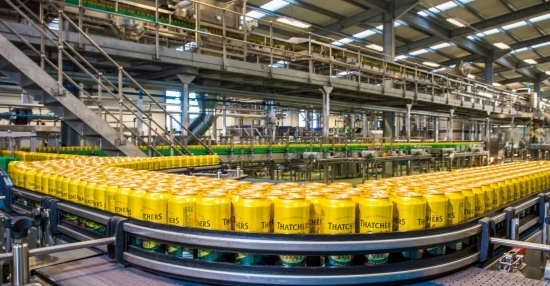 Based in Sandford, Thatchers prides itself on developing new, innovative products whilst maintaining its reputation for quality, premium ciders. During 2016 Thatchers continued to invest significantly to its cidermaking facilities, including storage capability and packaging facilities. It invested significantly in brands including Thatchers Gold and Thatchers Haze, as well innovating within its cidermaking with products such as Family Reserve, Orchard Cut Gin, and its short run cidermakers specials. “Investing back into the business is crucial for the continued success of the company. It encourages innovation and fresh thinking, something we are exceptionally proud of,” says Martin Thatcher, Managing Director. Investment: The family company has investment £5.9m into its cidermaking facilities, plant and machinery, and infrastructure, including the continued redevelopment of The Railway Inn.